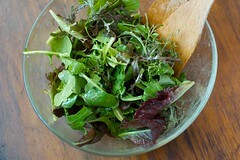 Green Salad by Marisa McClellan. After many months of gloomy weather and eating winter offerings of potatoes and cabbage, I am ready to welcome my spring crop of fresh herbs. I am especially excited to see the first shoots of dill. Dill originated in Eastern Europe, and has a high tolerance for cold weather. This healthy, aromatic herb is high in iron, calcium, and fiber. It is a very popular addition to salads in Eastern Europe. For the first Seder dinner, I’ll include the dill in an amazingly refreshing Spring Green Salad which combats the heaviness of brisket, potato kugel and the multiple pieces of matzoh. I’ve made this salad, which has the right balance of crunch and tanginess, for years. It reminds me of a good friend who happens to always be open to new experiences, encouraging others to join in on the fun. And, that’s what Passover should be about – a surprising and ever-changing blend of history, tradition, novelty, openness and joy. Combine lettuce, cucumbers, green onions, and dill in large bowl. Whisk olive oil, lemon juice, and garlic in small bowl until blended. Season with salt and pepper. Pour dressing over salad. Toss until evenly coated and serve. Enjoy! Abby Contract is the creator of Phoodistory, a celebration of Philly’s fanatical history with food.